A long tradition of trade between China and Java culminated with the establishment of a trading colony in 1297. 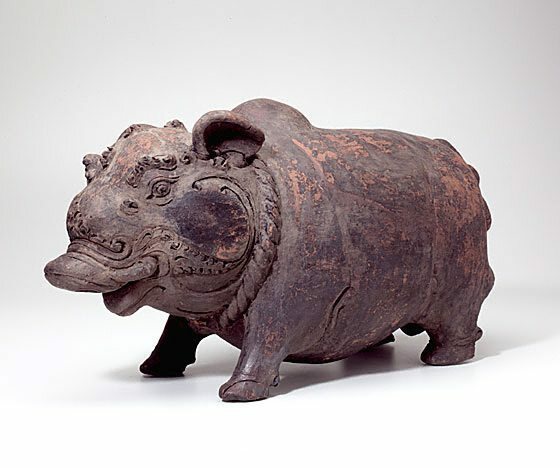 The Chinese were subsequently responsible for the first regular use of coins in Java, a practice that became widespread by the 15th century, large numbers of terracotta pigs were made, all provided with a slot in the back for the insertion of copper coins. 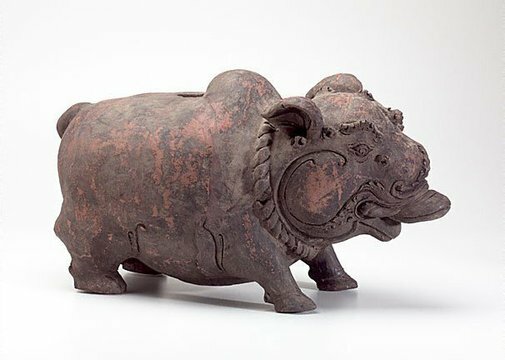 Pigs were popular because of their association with prosperity and were modelled with great care, usually wearing heavy necklaces and consisting of short, squat legs supporting great fat bodies, with deep carving and fantastic detailing around the head. Javanese money boxes were unlikely to have been owned by individuals and probably had a ritual function, attached to household or village shrines, becoming essentially a type of community chest. It is believed that the Dutch brought the concept of these 'piggy banks' back to Europe.